The Wood brothers were different as night and day. Hamilton, the older of the two, was big and broad, staid and serious, perfect material for MIT. Philip, the younger, was far more impetuous and had a flair for the dramatic. 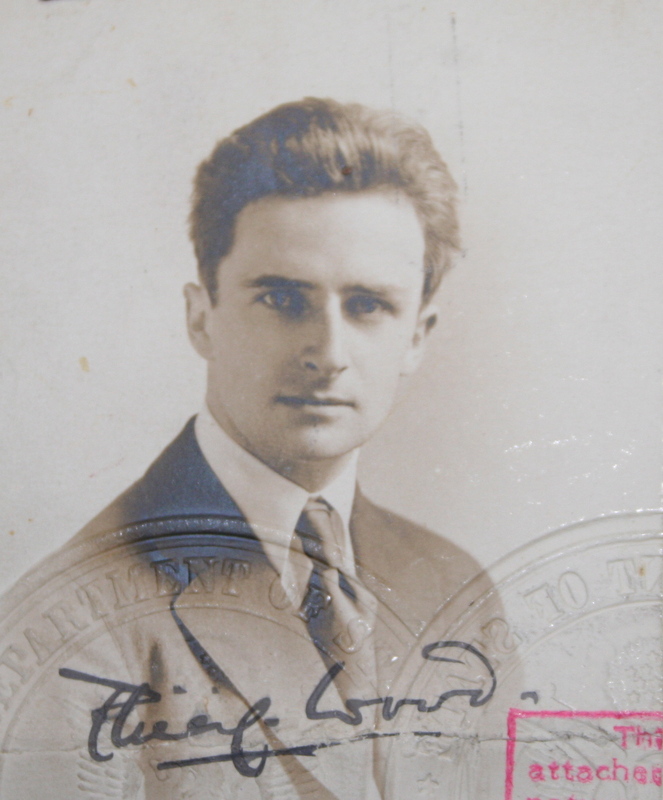 It was not terribly surprising when, at the age of 21, Philip announced his intentions to go abroad to France–however, the year was 1917, and America had just entered the Great War. The American Field Service was recruiting cadres of college students to drive ambulances at the front. Passport in hand, Philip set off for his great adventure. Philip was one of more than eight hundred young Americans who joined this auxiliary of the French Army. They accepted their positions as camion drivers without complaint, though the work was equal parts unglamorous and dangerous. From the town of Jouaignes, the Americans of the Réserve Mallet issued forth on almost daily, hauling tons of ammunition and supplies to the Chemin-des-Dames front, and returning to hospitals with wounded poilu. The job was dangerous, to be sure. Driving near the front lines under blackout conditions led to no small number of accidents; Philip wrecked his fair share of automobiles, and injuries were not uncommon. However, it was romantic to a large degree–in his spare time, Philip wrote poetry, drank red wine with French girls, and made lifelong friends, most notably Forrest “Tris” Wing. Philip was overseas for four months with the AFS. In the fall of 1917, he received a notice in the post–he had been drafted into the United States Army, where Hamilton was already a second lieutenant. The brothers nearly crossed paths; Philip traveling back for training, and Hamilton heading to the Front with the 33rd Division. Ham would fight at Amiens and at the Argonne; Philip was still in training when the war ended. Bob Allen, Irving (Kid) Hall, our Corporal, Kurt Day, and yours truly send regards to you from Camp Americaine, Jouaignes, France. But I have not been able to locate Fritz Glen or Besly, whom I should like to see. “Bes” was more courteous to me than any other fellow at 1067. Blessing, one of our fellows, has been to Soissons to the hospital with blood poisoning. Several sections are located there and he said that someone asked for me. It may have been Fritz, for the fellow mentioned you, but Bless says that he doesn’t remember the lad’s name. Says he was drunk at the time–drinking, I gather, being good for blood poisoning. It’s a great life here. My car is in the shop. I think someone stole the magneto or something or other. I don’t know when I will roll again. God knows, but I don’t. Did I ever tell you what a roll consisted of? You begin by rolling out of bed–about four in the morning–a thing that no actor should do. You freeze through breakfast, for it is here the latitude of New Foundland [sic]. Then you go out to your car. And lose your futilely saved youth cranking an obstinate engine. You don’t get it going, but the fellow ahead of you has conquered his and he tows you to the top of the hill and you roll down in confidence. Next–you wake up from a dusty sleep, in Bayoches to the sound of yelling French. You are about to be loaded. It is seven. They are thirsty and drinking wine. They are hungry and eating garlic, cheese, meat, and other things. All around you are shells, shells, shells, acres of them. Soixante-quinzes, trente-septs, cent et cinqs-cent, cinquante-cinques, Torpedoes. Or else you will have gone to a trench-materials parc; and will be greeted with miles of barbed wire, logs, lumber, fences, camouflage material. When you are loaded you move your car out to the repos where you wait a week for the other fellows. Finally a ram is assembled. A ram consists of eight cars (Pierce-Arrow 40 H.P trucks). The Sargeant [sic] blows a whistle and you are off. Then the fun begins. You are suddenly an expert automobile racer. You dash down one road and up another with a five-ton load, indefatigable in your attempts to pass other convois [sic], automobile, and horse. Tense, with one foot on a brake, one hand on the throttle, you turn a corner at full speed on two wheels, going all the time about twelve feet behind the car in front of you. The dust is so thick you would lose him if you did not follow so closely. Then, too, there is always the danger of some little French guy cutting in and breaking up the ram. You cannot expect to see. The dust is stifling; you cannot breathe–but you go on and on. If the chap ahead stops suddenly and you fail to sense it just a little before it comes you crash into him, endangering not only your own life–but, as well, that of people within reasonable distance, for you are usually not carrying lumber, but instant death. And if the fellow behind you does not “get you” in time, ditto–and the fellow behind him. Yes, all down the line. I have said “sense” the stop. It is nothing more than that–signals are useless in the dust. You cannot see any farther than the bare outline of the front truck. You cannot hear the change in his motor above the din of your own car’s on roads that are simply terrible, roads filled with holes, not the holes, necessarily, of shells, altho you see plenty of these, but the pitfalls caused by the wear and tear of three years war. You see nothing, but you hear something whiz by. It is not a bullet–it is an Officer’s car, passing you, driven by one of America’s racetrack drivers. This happens often, for you are near the front and many Officers are going many wheres. Finally, you arrive–somewhere–you do not know where–Somewhere In France. It is a parc near the lines–”Almost,” someone whispers, “Almost on the lines.” You see many Frenchmen, who will unload you at the roadside–for no car could get into the woods. So you wait a while, giving your engine a rest. The corporal comes around to inform you that it will be an hour before you will be unloaded as four other convois are ahead. You wonder for a minute “When in hell they must have gotten up this morning.” So you get out to do a little snooping around. What you find you would not dare to write your brother–fearing M’sieur The Censor. But you return after a while to the camion (car) and discover that it is a good time to eat some lunch–so you open the stuff, finding black bread, raw pork, a hunk of cheese, a piece of chocolate. I never knew in America such food could taste so good– so much could seem so little. We are unloaded and off again. We cross a river, a famous river of France, which I cannot mention, and drive to another parc, perhaps twenty kilometers back, for another load of some other kind of ammunition. All the time we pass a steady stream of life passing towards death; infantry, cavalry, artillery–long, long regiments. Now a regiment of blue French, now turbaned Indians on shining, small Arabian horses, now scarlet-capped Negroes–come from Tunis–or Algeria to fight for France. They carry long knives which they use to end the pain of the wounded. Let us say “end the pain,” it is nicer. When you are reloaded again you head off to some other point “near” the lines. Here you may have to wait longer– indeed, sometimes you have time for a swim–if you are near a river. The water may be very dirty, but it could not be as dirty as you, for you are unrecognizable. Then too, you don’t know when you will bathe again–arriving late at night and departing early in the morning as we are doing now. Night driving is the thrilling part of our life, however. We usually start home at dark, as the roads are under German observation and no chances are taken unnecessarily. There are no lights and the dust does not go down with the sun. So it is one long guesswork–one long gamble all the way home. Sometimes the second driver on the car ahead is kind enough to sit in the back, smoking a cigarette. But it is a hell of a job–hard enough to sit on the seats of these bumpy trucks on roads such as these, and cigarettes are scarce–by the way, for God’s SAKE send me some Bull Durham! I am at a loss, as it were, for a real smoke. A fellow blew into camp with a sack of Bull and was in constant danger of being kissed–for anyway five minutes. I am going to bring you home a paper of French tobacco as a souvenir–but I shall never demand that you smoke it. For after that you would never again see a doctor write “normal” to any blank in your health certificate. Zing! What was that? A soixante-quinze? No, only an Officer’s car passing us in the darkness. He nicked our mudguard to be sure­–but that is a small matter. The only matter worth of serious consideration is a head-on collision. As for worry–I–you forget how to do it. Let us imagine it to be about eleven o’clock, near midnight, not noon. We are somewhere near camp, we know that because we have been rolling steadily since eight o’clock. But because of the darkness and the dust one cannot even see the buildings, cannot follow at all the character of the road. Tris, who is driving the car ahead, and stops all of a sudden and you too, about an inch from him. Someone shouts, “At last.” You turn off the motor, reach for your gas mask and helmet (for shrapnel or gas attack are likely in camp as well as on the road). You reach for your canteen, your mess kit and hike for the barracks. I always hit it for the can, the latrine, first thing and do fairly well. Then I clean up. Then we eat. Then we pile in, to be awakened at four to do it all over again. This is my life. Still I have time to write letters, stories, poems. The fellows wonder how it’s done, and while they wonder, it’s done. Well, Kid, it’s six bells. Shorty, the cook who likes me will save the best piece of bum meat. Best, in France, is best looking. But he will not save it for long, so I’ll be on my way. I’m writing you sitting in a Rolls-Royce car–property of the Officer of camp, who also, it seems, likes me. But soon again I’ll be wearing off my bottom on a truck. Robert McClanahan Allen and Irving Gilmore Hall were former MIT students, and probably friends of Hamilton’s. Allen joined the French army and became a sous-lieutenant d’artillerie; Hall went into the US Motor Transport Corps as a second lieutenant. Probably Albert VanderVeer Blessing, of Albany NY. A town in the Aisne sector. Various sizes of artillery shells. Philip probably means 75mm, 37mm, 105mm and 155mm, with approximate spelling. Philip is describing French troupes coloniales. A “seventy-five,” or high velocity artillery round.